Figure will walk out from behind the curtains almost simultaneously. Figure walks into the small spot (stage-left), which should be fully lit. Figure arranges herself and holds her position for 5 seconds. <Small spot fades down> Light goes down on figure in her tableau. Figure pushes trolley of wine and glasses in, stops parallel to right-diagonal of stage. Figure leaves trolley, and walks to back diagonal wall stage right. Figure faces forward, signals Bio-box through precise head twitch or gesture. 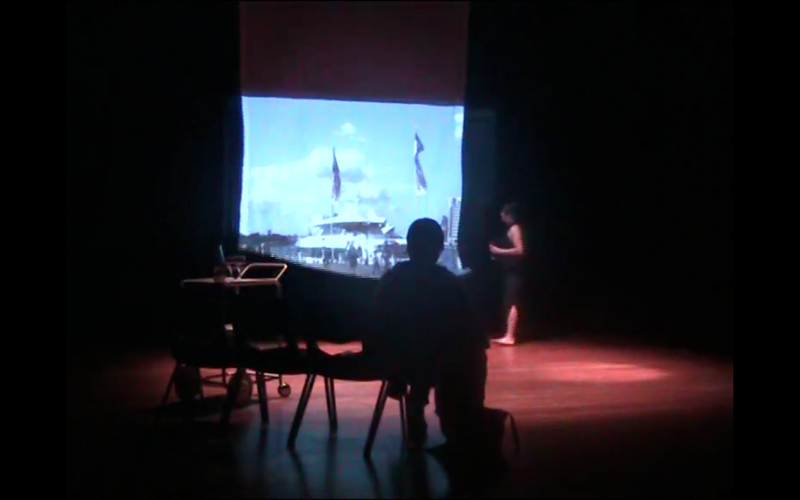 Figure returns to trolley and pushes it to be parallel to audience members. Figure turns bottle to face audience. Figure pours wine into glasses. Figure pushes trolley to stage right, situating trolley perpendicular to audience. Figure serves audience glass of wine individually. 9 – 15 audience – Serve 5, an audience member to serve the rest. 16 and more audience – Same as above. Service to all audience not necessary. Figure takes a glass of wine in hand. Figure unfurls drop, then proceeds offstage for a very brief moment. Figure turns to observe the video and sips on wine, eventually finishing glass. When wine is drunk, figure puts squats to place glass down on her right and stands back up. Figure than uses left hand to turn microphone inwards, as if to start speaking into. Figure bends down and moves glass out of circle of light. She repositions herself so the microphone stand is directly in front of her. To explore stage images, and to shift and challenge seemingly inconsequential perspectives and assumptions, moving the audience through different worlds – perhaps with the qualities of an open-ended but stable future. Through the use of minimal but necessary props, such as a bottle of wine, glasses, microphone, microphone stand. Through the use of brief literal gestures, such as the tying of hair, the pushing of the trolley, the pouring of wine, the signaling to the bio-box, the positioning of the microphone, the looking at the audience etc. Through lighting choices, such as the occasional black out which re-inscribes time through a breaking of a sequence, the large soft spot which is relatively more suggestive of real time and real interactions, and the small spot with hard edges which would point to a more performative existence of the figure. Through audio to complement Circular Quay backdrop. It is important that every gesture is precise. It is important that I stay long enough with certain images for the described situation to sink in. It is important that the wine glasses do not rattle against each other offstage while being pushed in on the trolley, as they add a distracting dimension to the clean subsequent stage image. Although I am playing with subjective time, it is important that I make clear what each stage image references. This means that if I am striking a tableau, that I commit to making it distinct. If I am interacting with the audience during the service of wine, that I am professional even as I speak to them. If I am signaling the bio-box, that I do it without confusing anxiety and the planned reminder of switching on of the video projection. If I am at the microphone stand and would appear that I was going to speak, that I really commit to that imminent possibility.